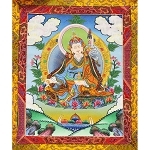 Padmasambhava, the ‘lotus-born’ and ‘precious guru’ (Guru Rinpoche), is the great eighth century Indian scholar and tantric master who is renowned for establishing Buddhism in Tibet. His complexion is flesh-colored, and he sits in the posture of royal ease upon a moon disc and lotus. His ornate ‘lotus hat’ is tipped with a vajra and vulture feathers, and he wears jeweled ornaments, a white under-robe, a blue and purple silk robe with a coiled copper neckpiece, the dull red robe of a Buddhist monk, a fur-lined outer cloak of dark red cloth, and ornate shoes. These attires symbolize his mastery of the various yanas or Buddhist paths. He holds a tantric staff or khatvanga in the crook of his left arm, holds a vajra in his right hand, and a skull cup of nectar containing a jeweled longevity flask in his left hand. On his lower right is his Indian consort Princess Mandarava, who holds a silk divination arrow and a longevity flask. 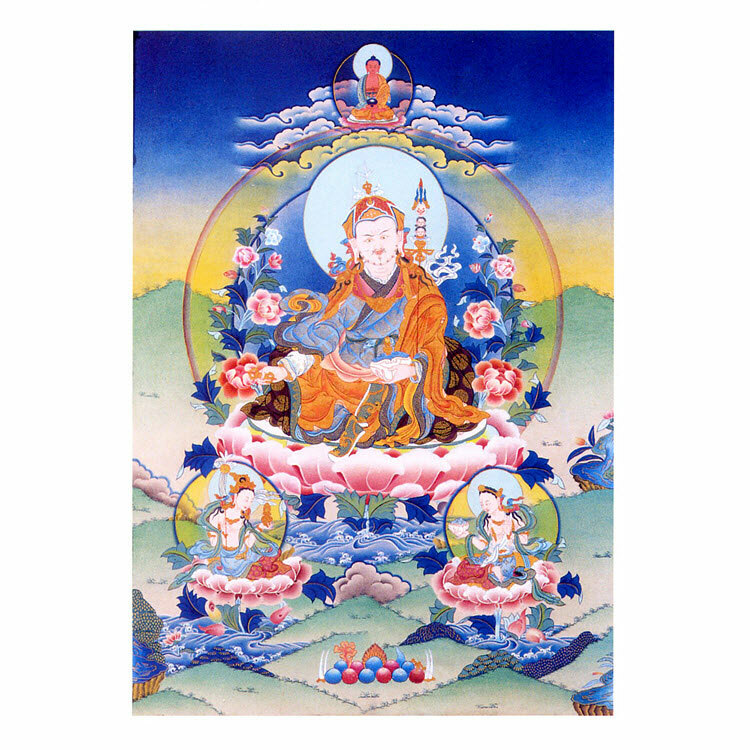 On his lower left is his Tibetan consort Yeshe Tsogyal, who holds a skull cup of nectar in her right hand and makes the gesture of protection with her left. Above his head is red Amitabha Buddha. ©Contemporary painting from Nepal, artist unknown.